'Attacking' td's can farm you all day without being spotted at the only positions that are usable to defend around the cap or where you have to go to push to decap. The only way to take them down is when you use a Recon Flight, which are usually only used by lights/arty. Some positions artillery can hit are just ridiculous.. I've been focussed down a lot by 2 or 3 arties in several battles (max is even 3 per side! ), while they had a lot of tanks to choose from and mine wasn't the biggest threat or easy to hit, but still they hit all the time behind a hill. Too many broken (new) tanks in the mode Spagetto's, Defenders, LT-432 with broken armor model. The French wheelies were not that bad in my opinion and I don't get why players complain about them so much. The mode has become nothing but a selfish grindfest, which made the game-play a lot worse. I've been blocked/pushed into enemy fire so many times by allies, only because they wanted more damage and took damage or was killed because of that. Players let you die on purpose, ignore the cap zones all the time, rush to objectives so you can't rank up fast. The fact that you don't have to play against higher tiers has a big price in my opinion..
Edited by BlackBloodBandit, 18 March 2019 - 11:35 AM. 1) Respawn points are not where they are indicated on maps. 2) Spawn camping still in many games. 3) Reticle not pointing correctly nor gun aiming at target on auto lock yet shell still hits. 4) Respawn point when enemy team capping is too far away to get to the base to assist even in very fast tanks. 5) LAAAAAAAAAAAAAAGGGGG. The lag was terrible, only died twice to it (I.E drove into the water once near starting spawn, another off a bridge) Did suffer major damage also whilst lagged. 6) There is no noticeable reward for winning the battle. Edited by 11poseidon11, 04 April 2019 - 05:53 PM. also I thought there were only three artilleries? I per line of attack? Edited by 11poseidon11, 04 April 2019 - 05:54 PM. Double the amount of Hit Points the objectives have and allow the objectives to spot for themselves / the team. This will help against yolo rushing LT's/WV's ruining the game by destroying them far too quickly. The other thing you could do is remove WV's, auto-loaders and auto-reloaders from Frontlines, but we all know WG wont do this as they have $$$ in their eyes from selling those premium tanks. I'm not talking about how good or how bad you are cuz to be honest, for me its not hard to get the general rank. I have only 1 prestige because of the fact that I'm getting triggered about all the bad things I've stated and quit after 2-3 games. Also if you put into perspective for someone that have a life, a job and other things to do, it is to much xp grinding required. That's the problem allowing yourself to get triggered. Change flank, change tank type.I get games where I think how the **** can people play so bad have zero clue, but we are normally talking 1-6 players, most times it is only 1-2 players so move away either relocate to another flank with hopefully better players after all there are 29 other players than you on your team and not all will be bad only a small handful. If relocation is difficult then if need be do a meaningful suicide run and respawn in a new sector. I had an idiot clicking my location yesterday I was highest ranked at the time on our sector Ltnt in first zone but went back to repair and enemy arty splashed me in repair even though not spotted ( think he was spamming shells there at every chance ) so had to go to another repair stopped on route to do airstrike then moved on and all the time another player was pinging my location, no clue I had been blocked from repair etc. So yes there are serious issues with Fl but it is down to you if you let that affect you and for me it is worth making the effort for the top two tanks on offer as I am primarily a non premium account player. Halve the rank reward for the losing team. Multiply the rank reward for the winning team by 150%. Then winning actually matters, and the team will(hopefully) stop farming damage in A or C(most likely C) while all other flanks fall. Give 3 random people with at least Prestige 1(or the highest rank if not possible) on each starting spawn the ability to call bombers(attack) into a capped and controlled zone of their lane, or a restricted zone if the first cap is not yet under control once(10 seconds delay). 3 defenders, 1 for each inital lane, get an ability Concentrated fire(1 use) for a zone not accessible for the enemy team, which ,after a cooldown of 5 seconds, destroys everyone from the enemy team entering or being in that zone until either 20 seconds have passed or the zone is accessible, whichever is earlier. Give view range to objectives, increase their HP, give us ability to repair them with engineering 5hp/second per tank, block ability to attack objectives when only one line is conquered - let attackers take down only objectives that are in that line. If not, place 3 small bot turrets around objectives that will shoot 60 pen 30 alpha 600 dpm ammo at lowest armored tanks in their range. It's soooo frickin annoying when platoon of EBR's just rushes objectives unspotted and takes them down. Halve the rank reward for the losing team. NO, it's already too grindy. Multiply the rank reward for the winning team by 150%. Edited by Cro006, 18 March 2019 - 09:14 PM. On last friday I reached prestige level 3+30sublevel and accepted prestige level 4 and when I clicked on confirmation button there was in really bad translation (Latvian) something that I reached maximal level. I accepted prestige level IV an my progress stopped. So rest of the weekend I played frontline for farming with only one skill token endabled. Maybe you can fix this, I dont need sub-level prizes and other goodies. Ok, even without skills its not hard to hit major or general, but I cant do any effort on caping or decaping without engineering skill. So I played almost two days only with one token on engineering skill. For balancing issues - there is bunch of rage quiters in early state of round, so maybe MM can switch some player to opposit side for balancing reasons like its on battlefield and other online games. The best thing about FL is that there is no Matchmaking, all tanks are level VIII. The Resistance / Hardness / life of these light tanks is excessive. I hope that in the following season of FL put a limit of 1 light tank per zone, 3 on each side.This would prevent the light tanks from breaking the game mode… in some match in 10 minutes the objectives had burst… and the rest of the team was still fighting in the first zone, amazing!! But I really like to play the FL mode, I'm going to keep playing it. But WG has to improve it. Edited by 11poseidon11, 04 April 2019 - 05:56 PM. I have to admit that this time WG nailed it. 9 maps in 1; unlimited respawn, with the possibility of changing the place of respawn; and probably one of a few places in the game where is possible to play with weelers; no friendly fire or damage; with the possibility to get some decent premium tank or gold, which is completely fair. It suits me the most bcoz it happens once a month. A week of serious grind in a month I can spare, anything more than that is irritating. FL It's the most dynamic thing I've played in this game, so far. Edited by rabitson, 21 March 2019 - 09:09 AM. 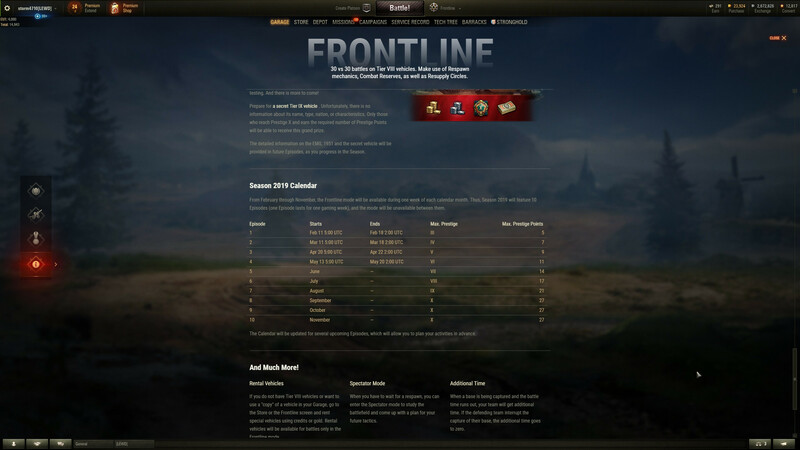 Hi there i would like to know why am i not able to play Frontline season 3 when it already started and i want to finish my progress from last season. What is going on. Moreover it says in garage, that Frontline Ends in 6 days but only states that season 4 starts in 27+ days. Why am i not able to participate in this seasion? Quick answer please i want to make progress and it is not possible. Want to know why????? It says episode 4 starts in 27 days... What is going on? How the F I missed episode 3? My biggest problem is the waiting time after you die in a tank - sincerely, i would love to see this checked into since some gameplays require different angles and obviously you might die faster and thus, is quite unrealistic to use any kind of strats. Question is, why do i have to wait THIS LONG between i can get back to my next tank? - Autoloaders are OP, especially Progetto 46, it has too high Armor/Speed/Pen/Damage in combination. This game mode shows the huge advantages of autoloaders over every single shot tank quite good. Limit the amount of Autoloaders / Buggys and/or add terrain that lets you make use of heavy armor. My german tanks are full of weak spots that are easily abused on those nice open spaces. Regardless of spaghetti autoreloaders, skorpion,and arty only play which is btw the best tactic, my issue is that i play 20 fkn defences and only few atacks. U have game log to check that, or should we ss every battle to prove that. I might be wrong, but if you're trying to cap, and get killed, you should be getting a lot more exp to the ranks than you are now. So 3 tanks in the cap at the start of cap and the records show zero bonus for being there! Because i was killed before cap ended? I say that as of right now after doing caps three times might have well not bother as my rank stayed at the first one. Doing damage get you far more it seems, so makes camping more how to play FL for ranks which goes against the spirit of wining. the TROLLS are in FL again, slandering others and pushing team into lines of red fire.. But no easy way to get this game trash reported is there. Edited by RockyRoller, 16 April 2019 - 03:11 PM.